We’ve received information that AMD engineers are hard at work on a range of GPUs featuring stacked high bandwidth memory to follow Fiji. While Fiji is AMD’s first GPU to feature this new high bandwidth graphics memory standard, it certainly won’t be the last. 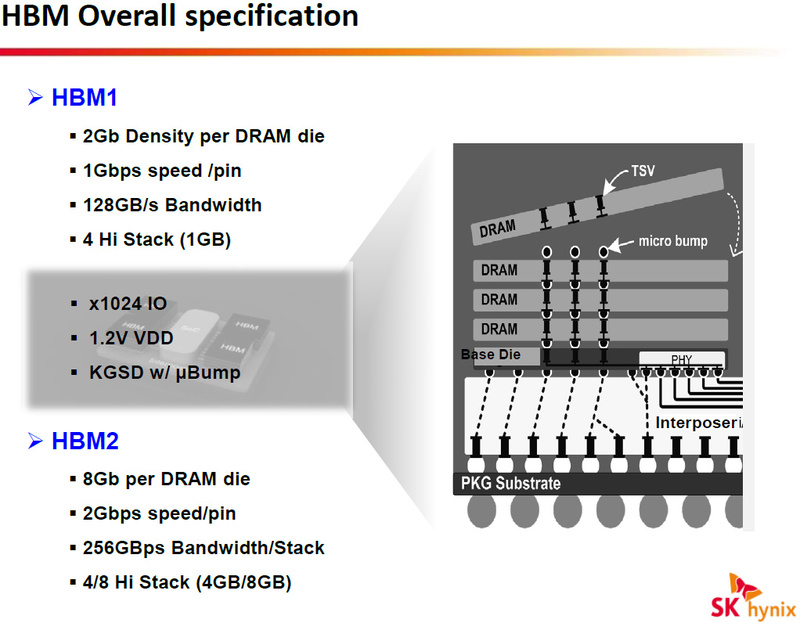 The range will span top to bottom solutions featuring SK Hynix’s stacked high bandwidth memory, HBM for short. This new lineup will also serve as the vehicle by which AMD will introduce this new memory technology to the mobile segment with the company’s first ever set of HBM GPUs designed for notebooks. The advantages that HBM brings to the table, including the significantly reduced PCB area and improved power efficiency, makes its use in notebooks an extremely attractive proposition. The smaller chip and board area as well as the power efficiency gains that HBM enables would have a more profound impact on notebooks where power and size are much more strict limitations than what we typically see on the desktop. However AMD expressed no shyness in leveraging those advantages on the desktop with the compact Radeon R9 Fury X and the even smaller Radeon R9 Nano. We found out last year that AMD is working on a new graphics architecture that will succeed GCN 1.2 ( Fiji and Tonga ) in 2016. The new family of GPUs based on this architecture are reportedly code named Arctic Islands with a flagship enthusiast GPU code named Greenland. This family is set to debut next year with second generation HBM and on a new FinFET (14/16nm) manufacturing process rather than 28nm which is what all discrete GPUs from Nvidia and AMD are currently based on. The process node jump makes Arctic Islands a true next generation family of products due to the benefits that accompany any migration to a smaller process node. The significant increase in transistor density, switching speeds and reduced leakage enable faster, larger, more power efficient and more complex GPUs than what’s possible on 28nm today. Our sources have told us that AMD management has thrown significant weight behind this new range of graphics chips to accelerate its development and time to market. 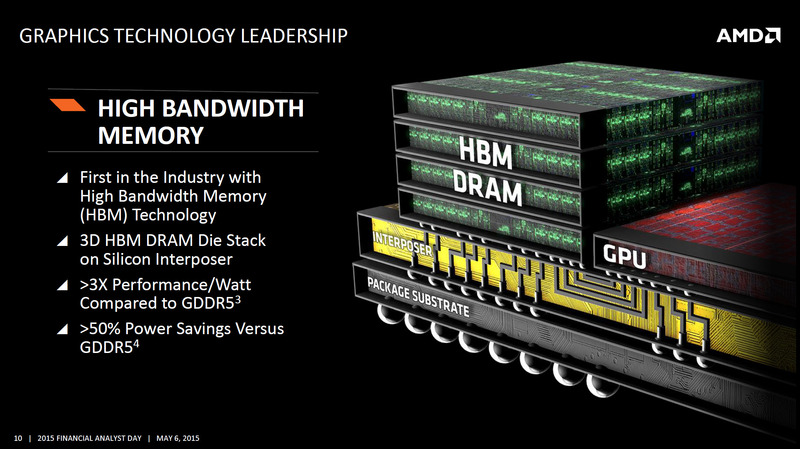 This is we’re told is to take advantage of a deal established with SK Hynix which gives AMD priority to HBM2 capacity which is going to be in limited supply initially. Capturing as much of the initial production capacity as possible would give AMD an edge against its main rival, Nvidia, going into the next generation of GPUs featuring second generation HBM technology. Which is exactly what the company is gunning for. If successful this would put Nvidia’s Pascal launch schedule behind what the company’s original plans. But the time waiting will not go to waste we’ve no doubt. The company has reportedly already taped out its first Pascal chip. However without access to HBM2 the graphics cards based on Pascal can’t enter production. This may lead the company to consider the possibility of spending more time on silicon design until HBM2 production capacity become sufficient. This fascinating dynamic is the result of AMD’s seven year involvement in the co-development of the High Bandwidth Memory JEDEC standard with its partner SK Hynix we’re told. Which is why AMD was the first company to introduce a product featuring HBM. And why the the first generation of the technology is exclusive to the company. It’s not clear whether SK Hynix will continue to give AMD priority access to production capacity with HBM3 and successive generations of the technology. Although AMD is clearly keen on leveraging its exclusivity deal with SK Hynix in the here and now. While being first to market can be advantageous, going second can prove to be equally favorable. As it would allow competitors to size up their competition and prepare a more appropriate response. We’ve seen this take place time and time again with each generation of GPUs. We can’t wait for 2016, HBM2 enables memory capacities that are eight times as large as what HBM1 can deliver today and memory bandwidth figures upwards of one terabytes per second. The current flock of enthusiast graphics cards from Nvidia and AMD can run most graphically demanding games like The Witcher 3 and Crysis 3 at 30+ FPS. 2016 however may prove to be the year when the gold standard of 60 FPS is finally attainable on the most graphically intensive games at 4K, HBM2 will undoubtedly play a crucial part in transforming that possibility to reality. Prices for 4K monitors have gone down considerably in the past couple of years and are continuing to go down. 2016 might just be when 4K becomes what 2560×1440 is today and 1440p in turn replaces 1080p as the new mainstream resolution for PC gamers.